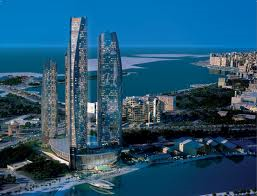 Etihad Towers Abu Dhabi – the luxury mixed-use development by Sheikh Suroor Projects Department (SSPD) in the heart of the UAE capital is amongst the winning companies of the esteemed International Property Awards in the 2013 Arabian regional competition. Etihad Towers competed against a number of developments in the region to receive this recognition. Richard Foulds, Head of Property at Etihad Towers, said: “Etihad Towers has proven to be a fully established integrated lifestyle community. To reach this stage in the awards confirms our position as the ultimate mixed-use property destination in the UAE and the region.” The Arabian Property Awards are part of the long established International Property Awards, the world’s richest competition when measured by the value of the projects entered. The judging panel consists of approximately 70 professionals.